Bruce Buckley, Dan Tille, Jeremy Powers and Rusty Williford capture the art of closing the door. In the fall of 2011, while on a cyclocross training ride with Dan Tille, I asked what he thought about helping me write a cyclocross skills book. 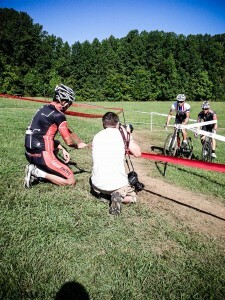 My idea was to use Dan’s years of experience and knowledge from racing, coaching and running ‘cross clinics and pair that with detailed images of the basic cyclocross skills and techniques. The idea was to have a book that covered, in every detail, the nuts and bolts of racing cyclocross in a presentation that would not be out of place on your living room’s coffee table. To accomplish that, I asked my good friend, fellow cyclocross racer, and professional photographer, Bruce Buckley, if he’d like to help us with this project. Bruce agreed and Skills, Drills and Bellyaches became a reality. Well, it actually became more of a theory. Reality was still a bit farther down the road. The task of actually writing and shooting the book was way more daunting than we realized and after an initial photo shoot in early 2012, we weren’t sure if the project would ever see the light of day. That’s when we approached Jeremy Powers with our idea and asked if he’d like to be our model. Since we have been conducting cyclocross clinics with JPow for several years, we knew his philosophy and way of doing things lined up with ours. But to have him be a willing participant in this project was a coup. And when he agreed to do it, we were beyond excited. Jeremy’s perfect form and technique made Bruce’s job of capturing the skills presented in this book that much easier. And the results are stunning. Having the photos and the concepts complete, all that was left to do was the writing and the design. And that was a process. A year of drafts and the extreme patience of Jennifer Franko Dudek, who designed the book, finally culminated in thepublication we offer to you today. Jen produced 18 different versions of the book. And in the end, I have no problem in saying we nailed it. 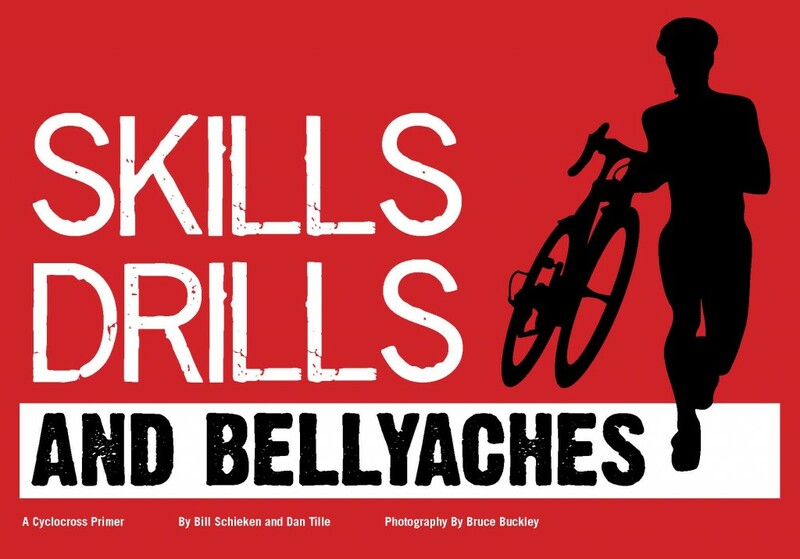 I could not be happier with the result and am beyond excited to be able to announce the release of this new cyclocross book: Skills, Drills and Bellyaches: A Cyclocross Primer. 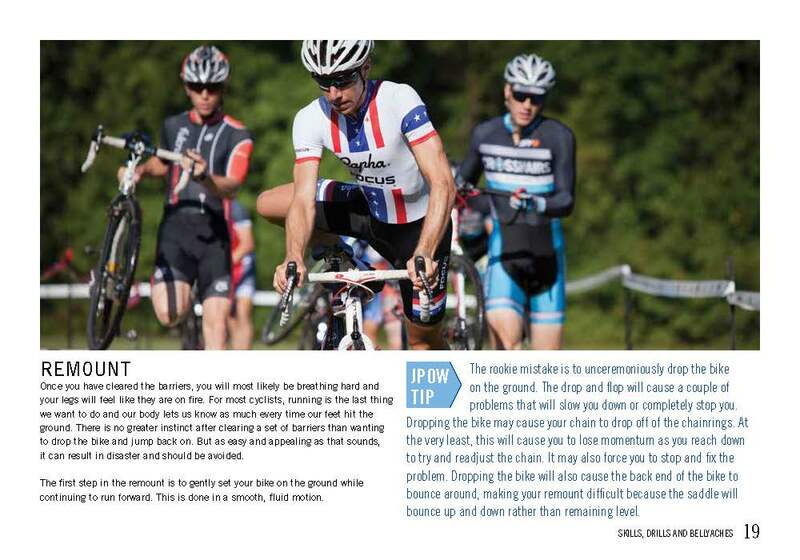 Every time you dismount from your bike you are either gaining or losing time on your competition. For instance, if you are a habitual stutter-stepper on remounts, this can cost you around one second each time you get back on your bike. If you are on a course that requires three remounts per lap and you do six laps in your race, that’s 18 seconds wasted. Let’s say you have similar issues on the dismount. Same math, 18 seconds lost. You are now 36 seconds behind a competitor who is equally fit, but gets on and off the bike more proficiently. Even if you have years of ‘cross racing under your bibshorts, you can always make improvements to your game. What is inside this book helps show you the way. Skills, Drills and Bellyaches teaches the techniques and skills that all racers, from beginner to elite, should learn and apply to become a better cyclocross racer. It covers basics, such as what to wear and how to get back on your bike after carrying it over an obstacle, as well as more nuanced starting techniques and how to mentally prepare for your race. This book serves as a solid primer for new racers, as well as a means for experienced riders to hone their craft. If you master the skills and techniques covered here, you can go into the cyclocross season with the same fitness you had last year, yet achieve better results. Books will ship the week of September 22nd. 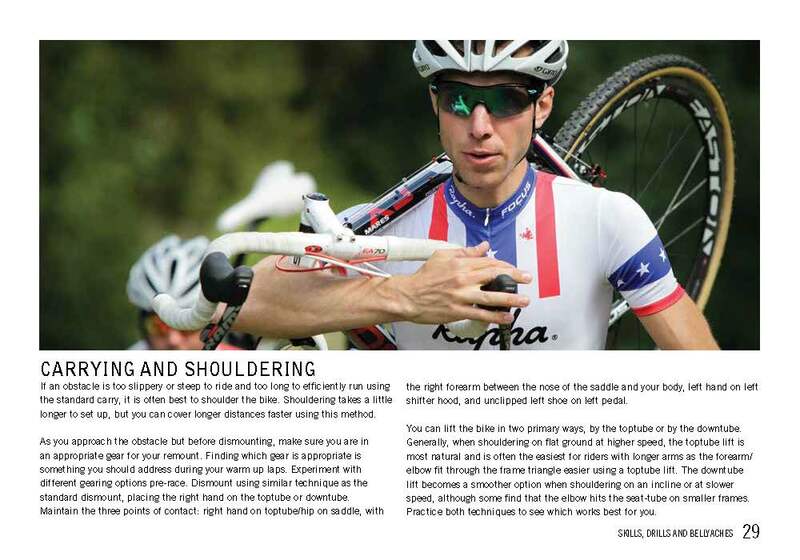 A portion of proceeds from the sale of “Skills, Drills and Bellyaches: A Cyclocross Primer” go to support the JAM Fund, a non-profit organization created by Jeremy Powers that is committed to nurturing and growing the next generation of American cyclists. Go to www.cyclocrossbook.com to order. This looks fantastic! Thanks for putting all the work into it, folks. I have a quick question if anyone is in a position to answer: Does this get into anything like handling off camber course features, finding lines, planning sketchy corners, starts, anything like that? All of it is covered. Off-Camber, finding lines, sketchy corners, starts and much more. Check Check Check and Check. Thanks for asking! Thanks very much! I feel kind of bad, I found it on the order page samples right after I posted this. Either way, pre-ordered, can’t wait!